“Stories are now open-ended, branching, hyperlinked, cross-media, participatory, exploratory, and unpredictable”. This is the definition of Web 2.0 storytelling offered by Bryan Alexander, Director of Research at the National Institute for Technology and Liberal Education (NITLE), USA; and Alan Levine, Chief Technology Officer for the New Media Consortium (NMC) in their article “Web 2.0 Storytelling: The emergence of a new genre“, published in the Educase Review, November-December 2008 issue. 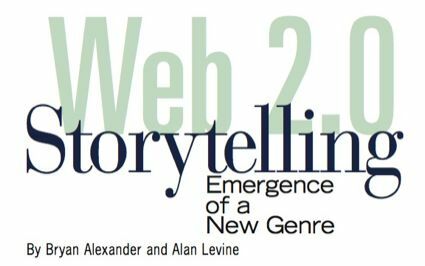 Microcontent and social media are the two main features of Web 2.0 storytelling, say Alexander and Levine. Every small chunk of content gives a primary idea or concept. Social media means that information is organised around people, and not around hierarquies of directory trees. As a matter of fact, they propose “that the new tools and forms of online creation represent a new genre of storytelling and creative expression”, especially for higher education. The authors has opened a wiki to invite to discussion around some questions: What is Web 2.0 storytelling? Is there really such a thing? 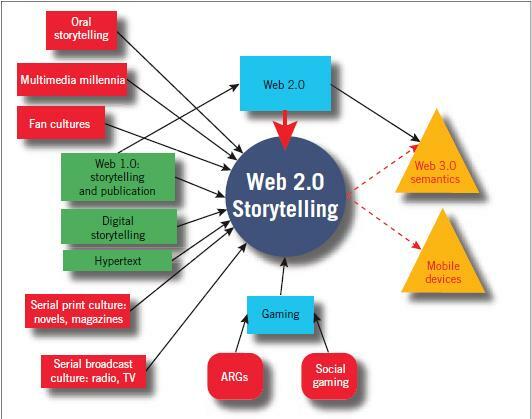 How does Web 2.0 storytelling work within teaching and learning? What are the implications for pedagogy, curriculum, and campus life? (Meanwhile, some other scholars are talking about Web 3.0 and its influence on online news. This is a recent text by Colin Meek published in Journalism.co.uk website).